Core FTP Lite is a freeware FTP client offering tons of exciting features that make it easier for you to upload files on FTP server. Featuring a multi-panel user interface, as available in the majority of other FTP clients, this tiny utility offers a wide range of other added features; and therefore, it suits advanced users to good effect. You can easily exchange files with remote servers via FTP, SSH, and many other file transfer protocols available with the software. All credit to its innovative format and compelling wide array of features that make this free app capable of beating competitors as well as leading many other paid products. Core FTP Le free download to enjoy a popup-free FTP experience with no spyware, adware, and no prompts for registering. The free and secure service offers you a fast, simple, and reliable way to maintain and keep your website updated. It additionally offers a secure method to upload or download files to/from FTP servers. 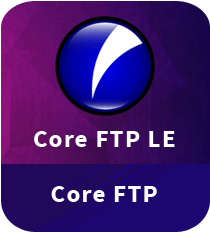 The popular Core FTP Le for Windows client includes features like SSL, IDN, TLS, SFTP, site-to-site transfers, browser integration, drag and drop support, firewall support, FTP resume, FTP URL parsing, filters, command line transfers, file viewing and editing, and much more. Try out Core FTP Le file transfer utility if you are looking for a full-fledged comprehensive solution to FTP transfers for free. Nothing comes better than this when you are new to FTP transfers. As far as popular FTP clients are considered, this software is one of the most ideal choices available out there. It’s wide set of security features make it an all-in-one solution for power users. We’d appreciate a bit simpler interface and not-so-professional oriented features, yet the FTP tool is great when it comes to handle what it is meant for.